With rituals completed, seventeen Barre Rotarians sat down to enjoy a Cobb salad and assorted sweet goodies. 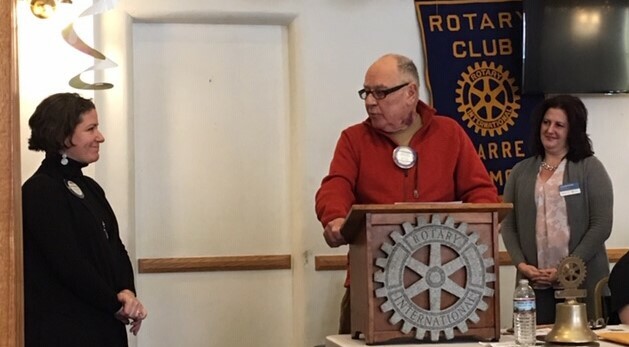 Tony was first on his feet to make a motion that we honor former Barre Rotarians by inviting them to lunch on us. It was seconded by Eddie, voted on and easily passed by unanimous vote. John was up next with a Happy Dollar because he won, albeit narrowly and for now, a seat on the Barre City Council. President Liane offered a Sad Dollar in sadness that her son announced that he might be moving to Arizona and another for experiencing her first Senior Moment since turning fifty last month. Tony opined that she was, like wine, getting better with age. When President Liane wondered if it gets worse, Tom rose to recount his skiing with Karl, and as they were putting on their boots, Tom looked down to discover that he had put his boots on the wrong feet. 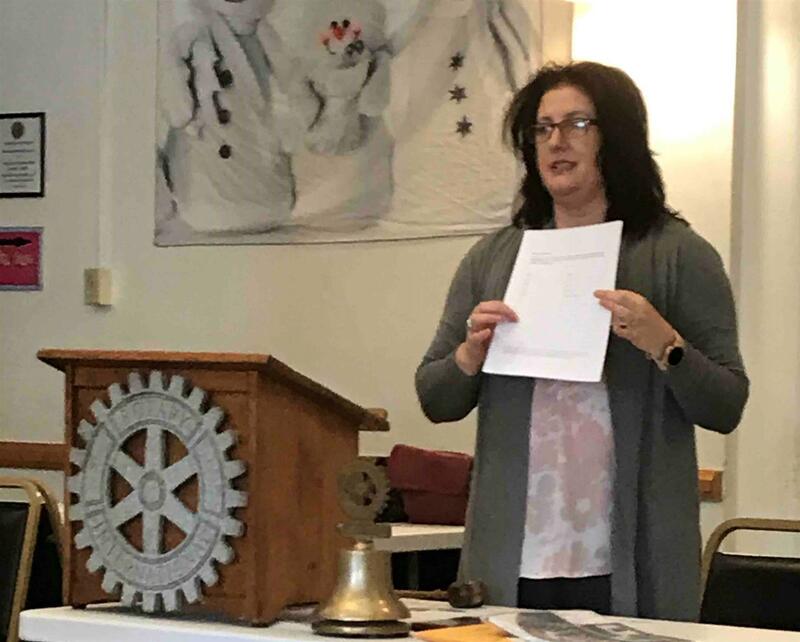 President Liane passed the gavel and proceeded to propose a fine of one-and-nine on Tom and Karl for choosing skiing over a Rotary meeting. Tom defended by reporting that he and Karl had their own meeting on the slopes. Karl’s defense was centered on his trying to break his self-imposed goal of skiing more than 49 days. Neither defense impressed those assembled and the fine passed. Caroline announced that the mural panels are about two weeks from being completed. 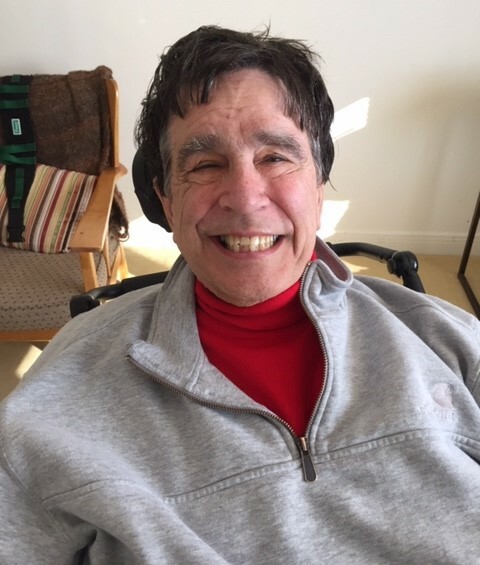 Elizabeth reported that Billy Rossi is comfortable at his place of residence in Shelburne and will likely remain there. President Liane suggested a field trip to visit Billy on the weekend and all agreed that would be a great idea. President Liane announced that committees had started to meet and said that she will have copies of committee rosters with purpose and member lists at the next meeting. Nicole DiDomenico was inducted into the Rotary Club of Barre. She is a former member of the Northfield Rotary Club and served for sixteen years. She initiated an international project in Tanzania and was the driving force behind the formation of Norwich University's Rotaract Club and Interact and Early Act in the Northfield schools. She is the Director of Civic Engagement, Service Learning and Campus-Community Partnerships at Norwich University. We are fortunate to have such an active and dynamic Rotarian. Bruce reported that George is celebrating a birthday this month and George said that he had a goal to reach 85 and he did. He also announced anniversary join dates: Me-9 years and Elizabeth-22 years. 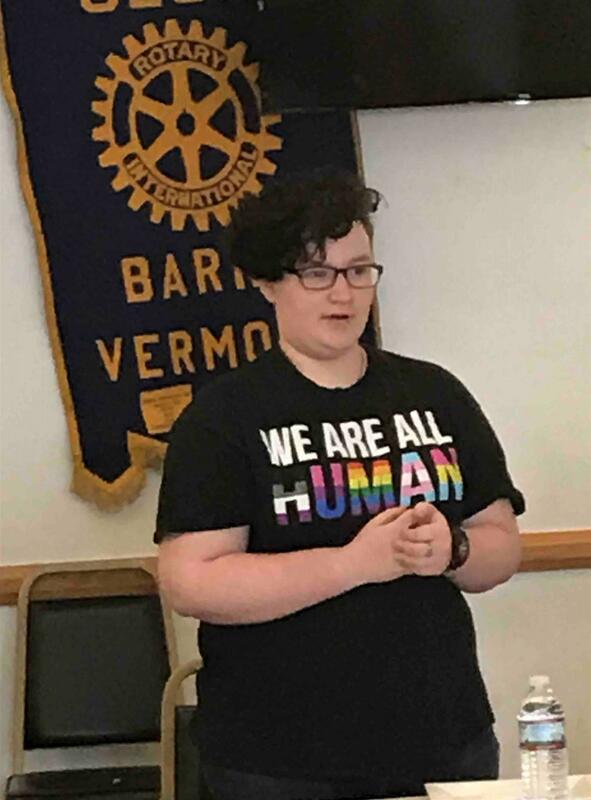 Brenda introduced our speaker, Kai Morse, RYLA (Rotary Youth Leadership Award) attendee at last spring’s leadership seminar at Northern Vermont University. She summarized her experience as interesting and fun. The participants were divided into teams and they became very close. Activities included team building games and communication exercises. While the talent show requirement caught her off guard, she recited poetry that she had written. During the question and answer period, Kai recited Emily Dickson’s It Was Not Death, For I Stood Up. She will participate in Vermont’s Poetry Out Aloud Contest at the Barre Opera House. When asked about what she had learned about leadership, Kai said that she learned that being a leader is not bossing others around, but taking ideas from others and acting on them. Sometimes being a leader is being a follower. She has put to use her new learnings as president of the QSA (Queer Straight Alliance) at Spaulding, but will step aside to give someone else an opportunity in a leadership position. Brenda added that Kai has provided training on student issues for her staff and faculty. Kai said that through her RYLA experience, she had gotten a taste of what college would be like. 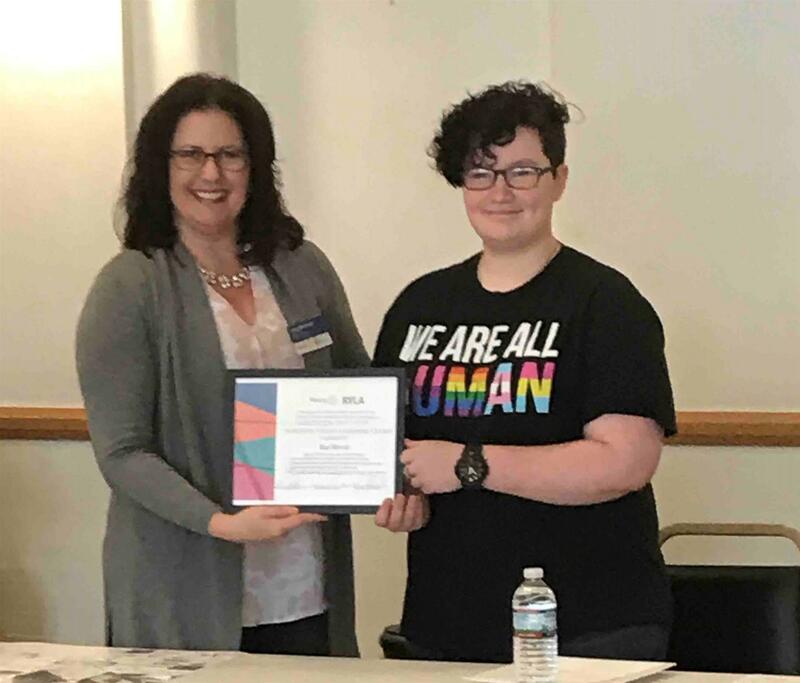 President Liane presented Kai with a RYLA Certificate and Barre Rotarians provided a warm round of applause in appreciation of her remarks.